At our dental clinic in Kamloops, our dentists provide a comprehensive range of general and cosmetic dental services, as well as oral surgery and custom mouth guards. Cosmetic dental treatments offered at Cedar Dental Centre in Kamloops are designed to improve the colour and symmetry of your teeth. 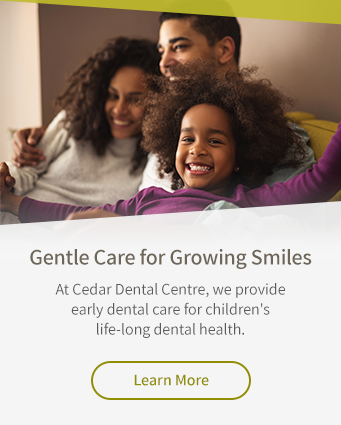 At Cedar Dental Centre, our dentists are committed to staying up-to-date on the latest dental technology, to help make your dental appointments more comfortable. Your oral health can impact the rest of your body. Dental appliances like bite guards, mouth guards, and snoring and sleep apnea devices can help improve the health of your oral cavity, and your overall health, too. Oral Surgery involves treating diseases, injuries and defects in the the oral and maxillofacial region. We offer oral surgery treatment options for our patients. If you are experiencing a dental emergency in Kamloops, call Cedar Dental Centre as soon as possible, and we'll make room in our schedule as soon as possible for one of our dentists to see you.